Escaping the madness of Seminyak for an ‘authentic’ Bali experience doesn’t always mean disappearing amongst the rice paddies of Ubud. Serenity seekers - we’re letting you in on a Stylephiles secret in the sleepy village of Cepaka, and its most precious hidden treasure Villa Sungai. A mere 25 minute ride from Bali’s new It-Girl, Canggu, Villa Sungai is as far from the buzzing sights and sounds of Seminyak as you could hope. Here the only buzz you’ll hear comes courtesy of the nightly symphony of Sungai’s jungle-like surrounds. It’s a different take on Bali luxury - no run-of-the-mill ‘luxe hotel’ rooms, excessive buffets and pocket-sized plunge pools to be found, instead Sungai offers a private chef with a gourmand menu and cocktails made to order, private massages at your leisure, and a lap pool with enough length to get your morning workout in. That is, unless you prefer a private pilates session on the terrace? Decor is always paramount for a Stylephiles stay, and Sungai does not disappoint. 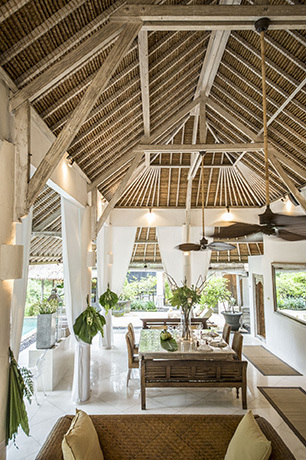 All whitewashed wood, handcrafted rattan and batik finishes, the villa and its three bedrooms all offer a beachy luxe vibe, in cooling cream and white tones. Outdoor bathrooms adjoin every room of the villa, each of which provide a spectacular contrast of glistening greenery against sleek black volcanic tile - it is pure magic, and it's these details, this seamless integration with its natural surrounds which sets Villa Sungai apart. The traditional Balinese style open living area is bedecked with a generous marble dining area, with a temptingly cosy day bed and multiple lounges ensuring enough nooks to keep everyone horizontal. Overhead fans provide a gentle reprieve from the humidity as you wile away the afternoons with made to order snacks and to-die-for Ginger Margaritas. By far the most striking feature of Villa Sungai is near invisible to the eye: their discrete and dedicated staff. Always on call yet never-to-be-seen, this incredible team are there to satisfy your every whim, going far beyond the 'butler service' touted by so many 5* resorts, which often is just a speed dial number on a phone. At Sungai, service is bespoke, discrete and thoughtful. All daily menus are yours to create, at a time and place of our choosing; day trip and activity options are plentiful but never pushed; and the communication is on a whole new level. Pamela, the kind and generous owner of Sungai will ensure your every wish is met through her thorough and considerate correspondence, nearly everything is taken care of before you've even stepped foot off the plane. With the delights of Seminyak and Canggu within arms reach, be sure to include Sungai into your next itinerary - worlds away from the hustle and bustle but as close to perfection as you could want. Booking your next luxury getaway? We never look further than Mr & Mrs Smith for the latest and strictly greatest in luxe, cool and quirky hotels. If it's hip and happening, they are all over it. And they have a price match guarantee! Plus the usual Smithy Extras thrown in (helloooo two x 60 minute massages).